Thanksgiving and Black Friday have gone mobile. Women are driving the web. And Hatchimals, the Nintendo Entertainment System, and Baby Alive will top 2016 holiday gift wish lists. Know the trends that will define the holiday shopping rush. Smartphones have become consumers' trusted shopping companions. 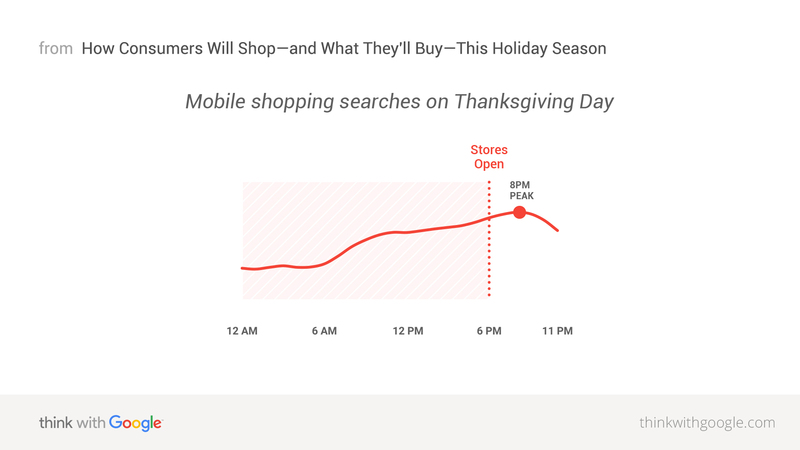 Mobile shopping searches surged in 2015, passing desktop for the first time on Thanksgiving and Black Friday.1 This year, we see supershoppers continuing to turn to their phones for research and purchases. 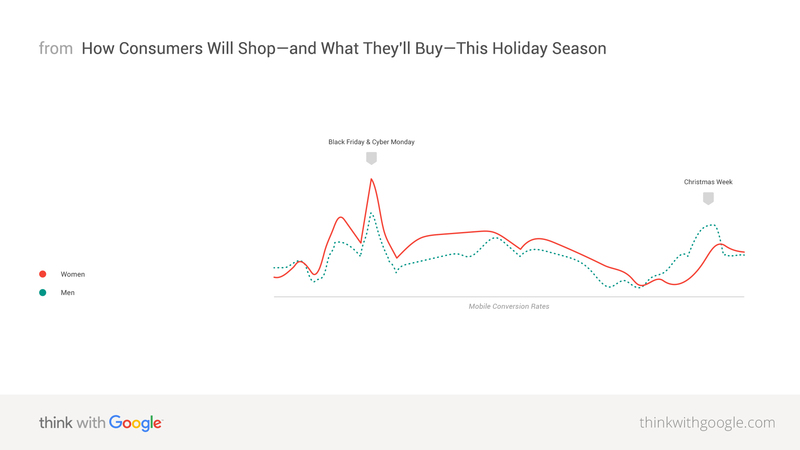 As we head into one of the busiest shopping weeks of the year, Google data reveals how consumers will shop and what they'll buy. The way consumers shop and behave during the holiday season is rapidly changing, from the way they create their gift lists to the way they purchase. Shoppers are proving that—both with their fingertips and their feet. 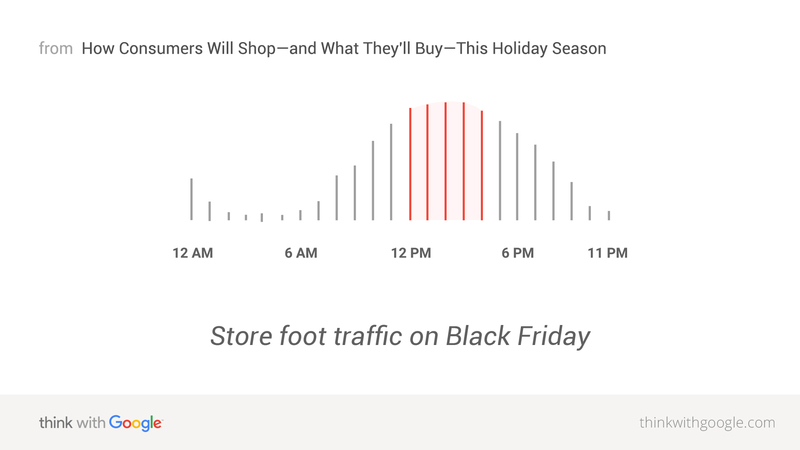 For more data about mobile search trends and shopper foot traffic on Black Friday, check out our infographic "What Google Data Reveals About Black Friday Shoppers." 1 Google Search Data, U.S., Nov. 2014 vs. Nov. 2015. 2 Google/Purchased Digital Diary: "How Consumers Solve Their Needs in the Moment," representative sample of U.S. smartphone users = 1,000, local searchers = 634, purchases = 1,140, May 2016. 3 Google Analytics, aggregated, anonymized data from U.S. accounts that are opted in to sharing benchmark data; mobile only, shopping vertical, Nov. 15, 2015 – Dec. 31, 2015. 4 Google Shopping Insights, U.S., all devices, Nov. 1 – Nov. 13, 2016. 5 Google Search Data, U.S., apparel, home & garden, beauty & personal care, computers & electronics, gifts, toys & games, photo & video, Nov. – Dec. 2014 vs. Nov. – Dec. 2015. 6 Google Data, aggregated, anonymized store traffic for clothing, electronics, and toy stores from a sample of U.S. users who have turned on location history, Nov. 2015. 7 Google Search Data, U.S., apparel, computer & electronics, and games & toys. mobile only. Nov. 2015. 8 Google Data, aggregated, anonymized store traffic for clothing, electronics, and toy stores from a sample of U.S. users who have turned on location history; store traffic after midnight attributed to Black Friday, Nov. 2015. 9 Google Search Data, U.S., apparel, home & garden, beauty & personal care, computers & electronics, gifts, toys & games, photo & video; mobile only, Nov. 2015. 10 Google Data, aggregated, anonymized store traffic for clothing, electronics, and toy stores from a sample of U.S. users who have turned on location history; Google Search Data, U.S., apparel, computer & electronics, and games & toys; stores considered open after 6:00 p.m. on Thanksgiving, Nov. 2015.